Artist's depiction of the Transiting Exoplanet Survey Satellite, which is slated for launch in 2017. NASA's groundbreaking planet-hunting Kepler observatory may be showing its age, but a handful of other spacecraft are poised to join the search for exoplanets and carry it into the future. The Kepler spacecraft has detected more than 2,700 potential alien planets since its March 2009 launch, revolutionizing scientists' understanding of worlds beyond our solar system. But the second of the telescope's four reaction wheels — devices that maintain the observatory's position in space — may be about to fail, putting the prolific mission's future in doubt. Gaia is designed to create an extremely accurate 3D map of about 1 billion Milky Way stars — 1 percent of our galaxy's total. This work could detect tens of thousands of new planetary systems, scientists say. "Researchers hope that Gaia will tell them more about the distribution of exoplanets around the galaxy: Are there more near the center or in the spiral arms? Are planets more common in areas rich in heavy elements?" reporters Yudhijit Bhattacharjee and Daniel Clery write in a special exoplanet section in the journal Science released online today (May 2). "High precision measurements by the satellite should help astronomers nail down planet sizes," Bhattacharjee and Clery write. Data gathered from the ground should provide these worlds' masses, allowing astronomers to figure out their density, the reporters add. NASA plans to launch a planet-hunter of its own in 2017, the Transiting Exoplanet Survey Satellite. TESS will use the transit method to search for worlds orbiting nearby stars, with a focus on Earth-size planets that may be capable of supporting life. Astronomers hope to then point NASA's powerful James Webb Space Telescope— an $8.8 billion instrument slated for launch in late 2018 — at the most promising of these newfound worlds, scanning their atmospheres for water vapor and gases that may have been produced by living organisms, such as oxygen, nitrous oxide and methane. Additions to the planet-hunting picture get a bit murky beyond 2017. But many researchers are hopeful that NASA will be able to build and launch a roughly $1.5 billion observatory called the Wide-Field Infrared Survey Telescope. In 2010, the U.S. National Research Council deemed WFIRST the top priority for the next decade of astronomical research. The telescope would not only hunt for exoplanets but also probe the mysteries of dark energy and galaxy evolution, among other phenomena. If approved and funded, WFIRST could potentially launch in a decade or so. But the proposed mission remains in a sort of limbo at the moment. All this talk about exoplanet space missions is not to discount, of course, the many finds that have been made from the ground. A number of research groups around the world have employed Earth-based instruments — the HARPS spectrograph, on a telescope in Chile, and the HIRES spectrograph, on Hawaii's Keck Telescope, are two examples — to spot exoplanets. These scientists often use the radial velocity method, which picks up tiny gravitational wobbles that orbiting worlds induce in their parent stars. But Kepler's success has spurred some of these researchers to change tacks temporarily, according to Bhattacharjee and Clery. 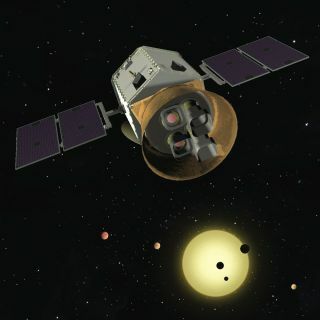 "Since the Kepler space mission began detecting new candidate exoplanets by the thousands using the transit technique, radial velocity teams have changed focus from discovering new planets to confirming Kepler detections and measuring their mass," they write.